I'm primarily an rpg gamer, but I dabble elsewhere. Here are a couple of thoughts on other games I've played in the last few months. I’m not a big sports guy- if I had to pick one to follow it would be hockey. 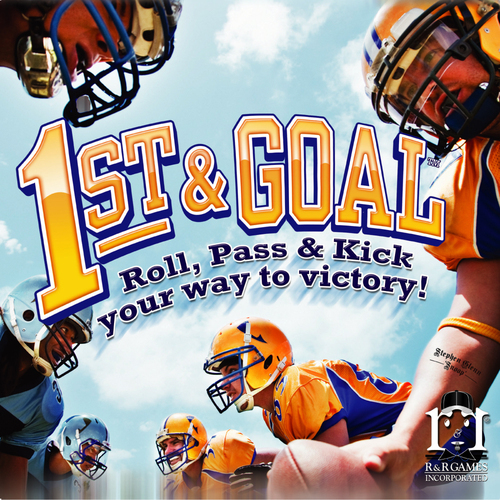 So I was more than a little stunned when I loved 1st & Goal . This is a football simulation game, ideally for two players. It has most of the elements of football in detail, rather than abstracting parts. Offense and defense each pick a play card and then cross reference the results. Based on that each side rolls specific colors of dice to determine the results. Penalties, cancelled plays, surges, and turnovers can all happen. Rules are included for fakes, onside kicks, and a host of other authentic details and choices. The card deck acts as a timer for the halves, a great and organic device. But probably the most fascinating innovation in the game (and there are many) comes from the play dice. The base game comes with a set of standard seven dice. But you can buy expansion sets- each with four new teams. Each team has their own set of seven play dice. Teams like the "Columbus Cobras" have ratings in passing, running, and defense. So a bad passing team will have lower values on the dice most commonly called for in passing plays. A strong defense team will have high negative yardage on their black defense die. It is pretty awesome- and I want to play with the different teams just to watch how they roll out. I’ve heard that passing can be stronger in the game, but I want to see that in practice before I look at more house rules. This is 90% of a great game. Quarriors! is a dice-deck building game. I like that it comes pretty close to saying, “Yup, we’re Dominion with dice.” The game has you rolling base dice which can generate creatures or more likely Gold…I mean, Quiddity…to bring creatures into play and summon more and different monsters and spells into your dice bag. Each is represented by a die. You roll six at the start of your turn and decide how to spend the results. Every die has different results- monsters usually have several levels, some with different powers based on what face comes up. Or you might have your creatures just turn up Quiddity, leaving you without beasts to summon. Players will pick up the basics of play quickly. Everything looks great and there’s tactile pleasure to being able to roll and sort your results at the start of a turn. If you like Dominion, but don’t like shuffling, this could be the game for you…provided you don’t mind randomness. If you do, then keep moving. There’s clearly some clever play possible here, but more likely there’s somewhat good and somewhat bad choices at any particular moment. If your dice roll badly, you’re going to lose and that will probably happen quite a bit. The reason I say that this is 90% of a good game is that the basic rules result in quick games, where a single good throw early on can really set the stage and lock the game down. Playing with those rules, we could see those rolls happen and play out as expected. We also felt like the game, with its "get X points to win" condition, barely got moving before it ended- especially with more than two players. It felt insubstantial, and more “dice-y” than it needed to be. The recent Quarmaggedon expansion adds two new rules aimed at solving this problem. They potentially make the game longer and more filled with strategic choices. The question will be whether the play sustains itself for those longer games- I hope it does and I’m looking forward to trying it. I’ve really enjoyed several Martin Wallace games (Liberte, Brass, Princes of the Reinaissance), and I’ll admit I approach these with some positive bias. 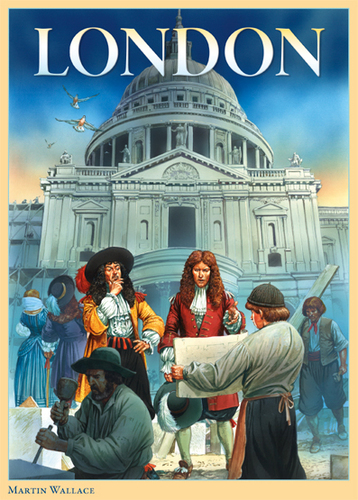 I first played London last year with our Goshen games group and really enjoyed it. I picked it up because it felt like an easier and quicker Wallace game, one perhaps I could play with my wife. Players build up their “version” of London over time, scoring VPs in play and at the end for area control. The game has some interesting mechanics: historical changes through sectioned card decks, trade outs for purchases, and potential penalties for running your “engine” through the accumulation of poverty points. However when I went back to play again more recently, the game didn't stand up to repeated plays. The choices don’t seem that interesting at the start. It feels rote and samey in the beginning- with players simply echoing actions. There are a couple of important steps/moves you have to take or else lose- at least in the games I played. Also London suffers from a player number problem. It works best with four players, though it can be played with two or three as well. With a lower number it loses most of its tightness. It is a decent game at four players, but not nearly as compelling with fewer. That’s not unlike Endeavor, another game I played again recently. I had suggested it but we had only four players. Endeavor works with five- in fact I’d say it is a great game with five, moving faster than you’d imagine and ending with tough choices and players constraining options. Less than five and that spark fades out. I’ve been thinking about that in particular because we’ve been playtesting my board game (going on two+ years of steady play with that). Right of Succession feels very different with five players, versus the standard 3-4 player game. With five players there’s much more happening and the environment shifts more quickly. You sacrifice some control and strategy for an aggressive and roller-coaster game. Both forms work for me- but it is interesting how the small shift creates that different feel. London and Endeavor both use hidden VPs- chits accumulated throughout the game versus a scoring track. Is there tension and benefit gained from that mechanic, or does it simply hide things to create an illusion and perhaps keep players from feeling like they’re out of the running? An abstract game, and one I’ve only played a little ways through. On the other hand, I watched my niece play through Journey in the course of an afternoon. The game itself is lovely- I mean truly beautiful. You take on the role of a figure, making their way through a landscape following a path. It may be a pilgrimage, it may be a quest- the game doesn’t impose a narrative, allowing the player to spin that for themselves. Your action choices feel fairly limited at first: d-pad movement, a jump, and a ‘call.’ But as you play through you begin to see the different ways that can be used. I hesitate to call it a platformer, instead it feels more like a directed exploration. Strikingly, as you travel you can come across other players though you may not realize it. Really worth playing or even just watching someone else play. This JRPG for the Wii only came out after an extensive campaign by players. The Wii generally has not been a great system for me. It does well when we have video game parties, but I’ve rarely been pulled in by any of the games on the system. Rune Factory Frontier remains the exception. I’ve bought and played a few other games on the console, but none have held my attention for any great span. 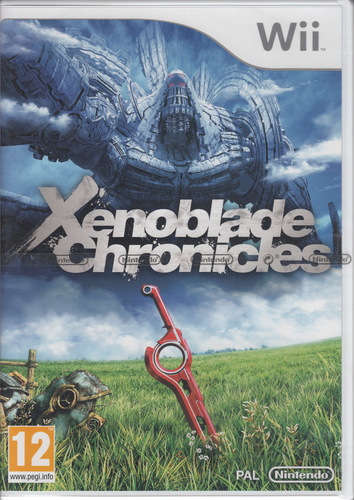 That being said, I’ve put about 190 hours into Xenoblade Chronicles and haven’t yet finished it. I know when I do finally wrap it up, I’ll play it again. Xenoblade offers a pretty traditional JRPG in terms of trappings. It has fantasy with pseudo-technology mixed in to give it a hybrid feel. The story isn’t any great shakes- but does have some interesting twists and turns. Linear and straight- you pretty much run along the rails of the story. But what you pass through offers neat choices for management and challenge. You have the usual character archetypes- but rarely do they carry the stupid ball. I’m used to games where the PCs react stupidly or don’t listen to one another so as to forward the plot. The characters hear actually listen and speak to one another. They still aren’t the most interesting and dynamic, but I find them pretty loveable because they don’t make me angry. I’m used to JRPGs taking one of two approaches to party and character management. Either all the characters end up seeming the same or a clear and obvious party develops, with other characters set to the side. In XC I have found myself switching around quite a bit. Each character has a distinct set of strengths- and they gain additional power through raising affinity which allows new bonus skills to be equipped. In practical matter it means I need to bring out and level everyone- and that doesn’t feel like a chore. Instead there’s a real pleasure to seeing how different groups play out and interact on the field. Play feels like a mix of active time and turn based. You engage foes and control your primary character, with two others run (pretty well) by the AI. You pick actions which can be affected by your positioning. Like much of the game, it feels inspired by MMOs. The game takes many other cues from those games, especially with a huge number of side missions (over four hundred). That plus the gem crafting system, collectible items, rebuilding a lost colony, and establishing relationships with the many, many NPCs makes this a game for the obsessive. In that regard it is pretty square-on for me. I like doing everything in the game. That works well here since the game feels very well balanced and crafted. Visually this isn’t great- but you get used to the roughness after a few hours and find the charm in it. The set and level design helps make up for that. Recommended if you dig jrpgs. Xenoblade came out about a year ago here and I've been playing it since; it's so enjoyable I'm in no hurry to finish it! I'd argue that it's better looking than you suggest; it's not as crisp and detailed as something on the PS3, but I much prefer its sense of design to something like Skyrim. That said, I was a little disappointed to discover the same monsters turning up later in the game, albeit with different colour schemes; this is nothing new for a console rpg, so perhaps it's unfair to single out Xenoblade. Did the US release keep the British voice acting? Even as a Brit, I found it grating at first -- although the Japanese voice track is even worse -- but I got used to it and now find it quite charming. I'd also agree about Journey; it's a beautiful piece of work. It reminds me of a more "arty" Shadow of the Colossus. The US localization seems to be identical to the European one- British voice actors which haven't bothered me nearly as those on some US releases. I actually didn't check to see if you could shift to the Japanese voice, something I usually do immediately. It has all of the British spellings as well. It has a definite sense of style and design, and that works for me. I think you're right about the art, but I'll admit it takes me a bit to grab on to if I jump back into it after playing something more recent and next gen, like FFXIII or Secret World. I don't think the graphics work against it at all, and I'm continually amazed at the scope of what's being rendered on screen. Indeed. When I first left the confines of the starting areas and went into the Bionis' Leg, and saw that it went on and on, seemingly without limit, I was surprised that I was playing a game on the Wii, given how often we are told that the Wii is rubbish. I think the only thing I dislike about it is the gem-crafting, but since that's optional it's not a problem.